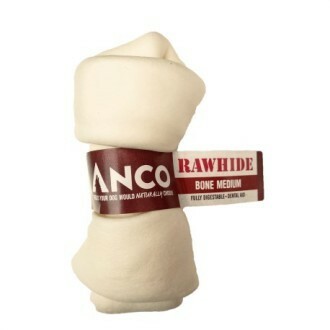 ANCO FARM FOOD RAWHIDE is incomparable to other dogchews because of the following: RAWHIDE is an European brand with a registered trademark which stands for a high premium quality. RAWHIDE is made of fresh, examined and veterinary approved beef hides only. The production company is part of a large slaughterhouse. The hides are processed directly after the slaughter of the cows. This in contrast with a lot of anonymous chew-products. RAWHIDE is fully digestible. Farm Food Rawhide is solely made of fully digestible hypodermic interstitial tissue. Therefore the dog can easily digest the complete Rawhide with no trouble at all.